if it was for the sit, you can try lifting the treat higher, or if that doesnt work you could work in a corner so the dog couldnt back up. Try holding the treat in different ways- a fist, or between two fingers- another thing you can do is click for the dog looking up at the treat first. if the dog is backing up from the stand to the down- you can at first try luring the dog under your leg or a low chair- to get the treat- enouraging the dog to go down..
hope that helped! I know! its hard! Hi Emily! First of all thank you for all of your great videos. Me and my lovely 4 month old Jack Russell Terrier Blake are really enjoying learning tricks! I have a problem with the "down" and the "stand". He soon learnt to sit, but there is no way for me to teach him how to go down. He keeps standing up in order to get the treat or he he gets frustrated and starts walking around. I do not want to force him, but I believe it is very important for him to learn to stay down. Can you please help me? Thanks for sharing such a nice video with us. From this new pet owners can easily learn and start training their dog. As these steps are the basis one to train which every one willing to train. first of all I want to say THANK YOU SO MUCH! You are fantastic and inspiring in such a gorgeous way. 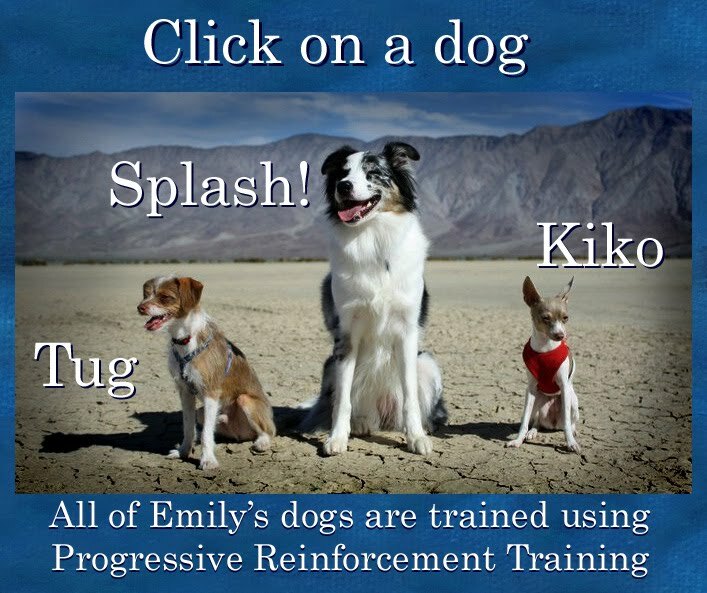 I'd wish more german dogtrainers would use clickertraining and could be able to see how wonderful your training with dogs is. I have a little question for you. Me and my two chihuahua ladys are living in a one-room apartement and I'm wondering how I can train both at the same time or if it is worse if one of the dogs could hear the clicker but gets no treat. How do you handle that with your dogs? Pardon me for my bad english.